Chandos portrettið, eftir ókendan listamann, National Portrait Gallery, London. 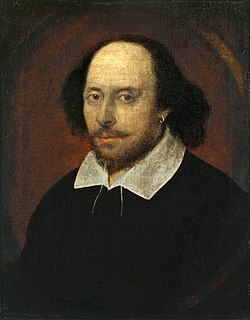 William Shakespeare (26. apríl 1564 (doyptur) - 23. apríl 1616) var enskur rithøvundur, hann verður sagdur at vera mætasti sjónleikarahøvundi, sum skrivað hevur á enskum máli. Hann leikti ofta í Globe-sjónleikarahúsinum í London, har flestu leikir hansara vóru framførdir. Hann var sannur málmeistari, og persónslýsingarnar, speiið og skemtiligi stílur hansara gera, at leikirnir siga líka nógv nú, sum tá ið teir vórðu spældir á fyrsta sinni fyri umleið 400 árum síðan. Talið í klombrum er árstalið fyri nær ið hildið verður, at verkini eru skrivaði. Peter Ackroyd, Shakespeare. The Biography, London 2006: Vintage, ISBN 978-0-7493-8655-9. RalphBerry, Changing Styles in Shakespeare, London 2005: Routledge, ISBN 0-415-35316-5. David Bevington, Shakespeare, Oxford 2002: Blackwell, ISBN 0-631-22719-9. Fausto Cercignani, Shakespeare's Works and Elizabethan Pronunciation, Oxford 1981: Clarendon Press, ISBN 0-19-811937-2. E. K. Chambers, The Elizabethan Stage, 2, Oxford 1923: Clarendon Press, ISBN 0-19-811511-3. David Cressy, Education in Tudor and Stuart England, New York 1975: St Martin's Press, ISBN 0-7131-5817-4. Roland Mushat Frye, The Art of the Dramatist, London 2005; New York: Routledge, ISBN 0-415-35289-4. Frank Kermode, The Age of Shakespeare, London 2004: Weidenfeld & Nicholson, ISBN 0-297-84881-X. Joseph Pequigney, Such Is My Love. A Study of Shakespeare's Sonnets, Chicago 1985: University of Chicago Press, ISBN 0-226-65563-6. Irving Ribner, The English History Play in the Age of Shakespeare, London 2005: Routledge, ISBN 0-415-35314-9. Samuel Schoenbaum, William Shakespeare: Records and Images, Oxford 1981: Oxford University Press, ISBN 978-0-19-520234-2. Gary Taylor, William Shakespeare: A Textual Companion, Oxford 1987: Oxford University Press, ISBN 0-19-812914-9. Michael Wood, Shakespeare, New York 2003: Basic Books, ISBN 0-465-09264-0. »William Shakespeare« í Wikimedia Commons. Hendan síðan var seinast broytt 17:50, 11. mar 2018.